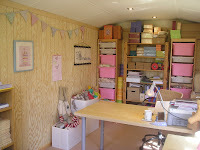 Cottontails Baby: New premises & new toys! New premises & new toys! Oh dear, sorry again for yet another long gap between posts - although I think relocating business and moving house in the same month is a relatively decent excuse... But the good news is that things have settled down now so hopefully I'll have more time for the little extras like writing on here. 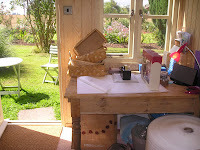 Cottontails has now officially moved into the new garden office! Naturally the electrics / phone / broadband etc took about three times as long as predicted so we haven't been here long but so far it is proving to be a beautiful, peaceful place to work. We keep some of the smaller items and soft toys in the office, with the bigger items and things in bulk held in a separate storage facility nearby. It's useful to have the toys on hand like this as I get calls most days from customers wanting some specific bit of information - like the length of a bunny's ears or the exact pattern on a mouse's dress - so it's good to have the things in front of me, where I can pick them up and handle them, and not too far away in a warehouse. This is where most of the packaging takes place. Because it's Sunday and I've just tidied up it is looking particularly neat and tidy. Normally it is awash with parcel tape and brown paper! 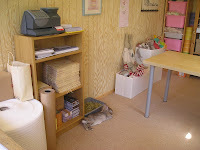 And here's Humphrey hard at work in the office :-) He comes out with me every morning and I love my walk down the garden with a bunny under my arm and a cup of coffee in my hand. We have builders working on the house at the moment and I'm sure they think I'm mad! I have lots of news to tell you about over the next few days. 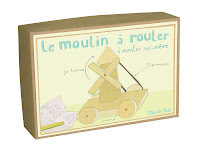 We have just received one of our biggest ever orders from Moulin Roty, jam packed with gorgeous new toys like sew your own dollies and build your own wooden toys, some lovely new boxed soft toys, loads of play kitchen bits and bobs like tiny wooden coffee grinders... oh they're all lovely! I will be putting them on the website this week and will write more about them as I do. Also this week I will be picking a winner from our Maileg bunny competition, launching a new one and also getting our first 'giveaway' underway. So plenty to look out for, and plenty of reasons for me to write regular entries and not disappear for months at a time! Glad you have now settled into your new space- it looks lovely!